Background Asthma guidelines guide health practitioners to adjust treatments to the minimum level required for asthma control. As many people with asthma have an eosinophilic endotype, tailoring asthma medications based on airway eosinophilic levels (sputum eosinophils or exhaled nitric oxide, FeNO) may improve asthma outcomes. Objective To synthesise the evidence from our updated Cochrane systematic reviews, for tailoring asthma medication based on eosinophilic inflammatory markers (sputum analysis and FeNO) for improving asthma-related outcomes in children and adults. Data sources Cochrane reviews with standardised searches up to February 2017. Study selection The Cochrane reviews included randomised controlled comparisons of tailoring asthma medications based on sputum analysis or FeNO compared with controls (primarily clinical symptoms and/or spirometry/peak flow). Results The 16 included studies of FeNO-based management (seven in adults) and 6 of sputum-based management (five in adults) were clinically heterogeneous. On follow-up, participants randomised to the sputum eosinophils strategy (compared with controls) were significantly less likely to have exacerbations (62 vs 82/100 participants with ≥1 exacerbation; OR 0.36, 95% CI 0.21 to 0.62). For the FeNO strategy, the respective numbers were adults OR 0.60 (95% CI 0.43 to 0.84) and children 0.58 (95% CI 0.45 to 0.75). However, there were no significant group differences for either strategy on daily inhaled corticosteroids dose (at end of study), asthma control or lung function. Conclusion Adjusting treatment based on airway eosinophilic markers reduced the likelihood of asthma exacerbations but had no significant impact on asthma control or lung function. What is the overall outcome of trials that use eosinophilic markers (sputum eosinophil counts or exhaled nitric oxide levels) to tailor asthma treatment in children and adults? Treatment tailored using eosinophilic markers results in fewer asthma attacks when compared with traditional management but did not impact on day-to-day reported symptoms, lung function or final daily inhaled corticosteroid doses. This systematic review combines 3 Cochrane reviews with 22 included studies, examining the updated evidence for objectively measuring inflammatory markers to personalise asthma management. The increased attention to personalised medicine, which for asthma includes basing treatment on objective airway inflammation,11 is reflected by interest in our previous systematic review.12 We present an update to our previous review12 by providing an overview of three recent related Cochrane reviews,13–15 each of which addressed a different question as per the Participants Intervention Camparator Outcomes (PICO) framework. 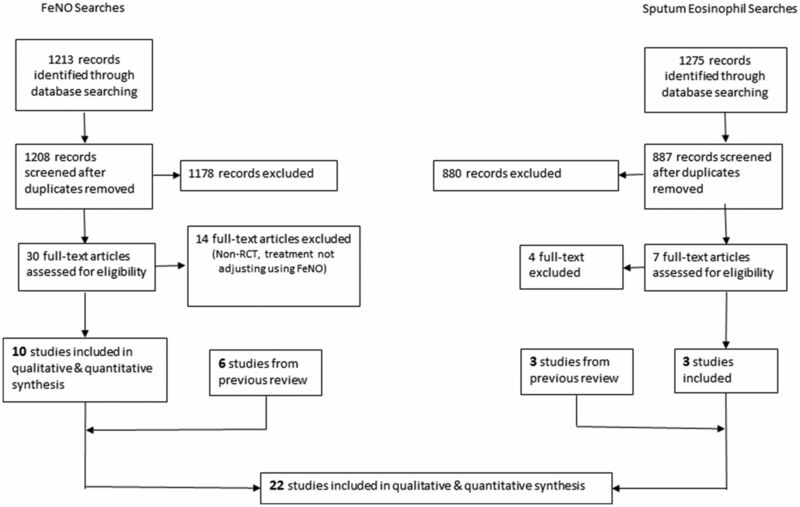 The objective of our systematic review is to evaluate the efficacy of tailoring asthma medications based on FeNO or sputum eosinophils (ie, eosinophilic-based strategy) in comparison with controls (clinical symptoms with or without spirometry/peak flow) for asthma-related outcomes in children and adults. We used Cochrane methods and searched (up to February 2017) for eligible randomised controlled trials (RCTs) that compared adjustment of asthma medications based on sputum eosinophils or FeNO levels with adjustment according to clinical symptoms (with or without spirometry/peak flow). As outlined in the reviews,13–15 searches used keywords in electronic sources (Cochrane Airways Group Specialised Register of Trials, the Cochrane Central Register of Controlled Trials (CENTRAL), Medline, EMBASE) and reference hand searching. Searches of bibliographies and texts were conducted to identify additional studies. Trials that included the use of other interventions were included if all participants had equal access to such interventions. Participant inclusion criteria were children and adults with a diagnosis of asthma according to a guideline-defined criteria. Exclusion criteria were as follows: eosinophilic bronchitis, asthma related to an underlying lung disease such as bronchiectasis and chronic obstructive airway disease, or diagnostic categories such as ‘cough variant asthma’ and ‘wheezy bronchitis’ where controversies exist. Risk of bias for each included study was assessed using the Cochrane Risk of Bias tool available in the RevMan5 software. Seven components were assessed in duplicate as low, unclear or high risk of bias: sequence generation, allocation concealment, blinding of participants and personnel, blinding of outcome assessment, incomplete outcome data, selective reporting and other bias. Primary outcomes were indices reflective of asthma exacerbations (defined by study authors) during the follow-up period. Secondary outcomes were mean differences (MDs) between groups in objective measurements of asthma (FEV1, peak flow, airway hyper-responsiveness), FeNO level, symptoms of asthma (as reported in Asthma Control Test (ACT) or asthma-related QoL score) and ICS dose at final visit. The results from studies that met the inclusion criteria and reported any of the outcomes of interest were included in the subsequent meta-analyses. We a priori separated children from adult studies. All data were double entered (HLP/ABC or HLP/KK) and triple checked (CJC). We combined data for meta-analyses only where it was meaningful (ie, based on clinical and statistical criteria). We analysed dichotomous data as ORs and continuous data as MD, or as standardised MD if different measurement scales were used across studies. For dichotomous data, we reported the proportion of participants contributing to each outcome in comparison with the total number randomised. Generic inverse variance was used for rate ratio (RR) analysis of common events, where one subject may have more than one event. The RRs were taken from the published papers and SEs of the log RR were calculated from CIs or p values published in the papers. Numbers needed to treat (NNT) were calculated from the pooled OR and its 95% CI applied to a specified baseline risk using an online calculator.16 Fixed effects were used throughout unless stated otherwise. Any heterogeneity between the study results was described and tested to see if it reached statistical significance using a χ2 test. We included the 95% CI estimated using a random-effects model whenever there were concerns about statistical heterogeneity. Heterogeneity was considered significant when the p value was <0.100.17 We used the I2 statistic to measure heterogeneity among the trials in each analysis. If we identified substantial heterogeneity (>50%), we reported it and explored possible causes. Subgroup analysis was planned for (1) basis for adjustment of ICS in the control group (guideline-driven monitoring vs non-guideline driven); (2) use of spirometry or peak flow as an adjunctive monitoring tool for adjustment of medications (vs non-use of spirometry or peak flow); (3) baseline ICS dose at commencement of intervention (<800 µg/day vs >800 µg/day budesonide equivalent); (4) cut-offs for adjustment of medications. We used the five Grading of Recommendations Assessment, Development and Evaluatation (GRADE) considerations (study limitations, consistency of effect, imprecision, indirectness and publication bias) to assess the quality of a body of evidence as it relates to the studies that contributed data to the meta-analyses for the prespecified outcomes. The searches in 2017 identified 1208 publications for FeNO-based strategy and 1213 for sputum. After screening, 30 and 7 papers respectively were retrieved but only 16 and 6, respectively, fulfilled the inclusion criteria (figure 1), including the nine studies from the previous review.12 The 22 studies consisted of 16 FeNO-based trials (seven adults, nine children) and six sputum-based trials (five adults, one children), which included a total of 3500 participants, of whom 3208 completed the studies (91.7%). Preferred Reporting Items for Systematic Reviews and Meta-Analyses flow chart. FeNO, fractional exhaled nitric oxide; RCT, randomised controlled trial. Of the 22 studies included (table 1, online supplementary Table 1), 9 were single-centre studies,18–26 2 were dual-centred27 28 and 11 were multicentred.29–39 Ten studies were in children or adolescents,18–20 26 28–30 32–34 and 12 involved adult participants.21–25 27 31 35–39 We classified studies into children/adolescent studies based on the mean age reported as opposed to the entry criteria. Nine studies were double-blind, parallel group trials,18 24 26–29 31 32 35 seven were single-blind, parallel group trials,19 21 22 25 33 34 38 and six studies had no blinding.20 23 30 36 37 39 Twenty-one papers were published in English and one was translated from Chinese.22 Seven studies were supported by Aerocrine, the manufacturer of FeNO analyser (online supplementary Table 1). There was a degree of clinical heterogeneity among the studies (table 1, online supplementary Table 1), primarily with regard to the definition of an asthma exacerbation and the FeNO and sputum eosinophil cut-offs used for adjusting therapies. Although asthma exacerbations were an outcome measure in all papers, they differed in how they were defined ranging from unscheduled emergency visits25 to defining an exacerbation using diary card data.21 28 Two studies defined an exacerbation as a decrease in morning lung function.24 36 Although there were variations in how exacerbations were defined, all included studies uniformly managed exacerbations with rescue oral steroids. Algorithms for adjustment of medications differed among studies and the cut-off values to step-up and down also varied across the FeNO studies (range 1220 to 50 ppb37), and the sputum eosinophil percentages range from 231 to 823. In both adults and children, the number of participants with exacerbations (during the follow-up period 18–52 weeks) in the group whose treatment was adjusted according to FeNO were significantly lower than the control group; in adults, OR was 0.60 (95% CI 0.43 to 0.84, p=0.003; participants=1005; studies=5) and in children the OR was 0.58 (95% CI 0.45 to 0.76, p<0.0001; participants=2284; studies=8) (figure 2). Based on the number of participants who had at least one exacerbation over the study period (table 2), the number needed to treat to benefit (NNTB) over 52 weeks was 12 (95% CI 8 to 32) in adults and 9 (95% CI 6 to 15) in children. Number of subjects who had ≥1 exacerbation over the study period (FeNO). The exacerbation rate in the FeNO-strategy group was significantly lower than controls in the adult studies (RR 0.59, 95% CI 0.45 to 0.76; participants=842; studies=5). There was no significant difference between groups in the paediatric data and as statistical heterogeneity among studies was present, we used random-effects analysis to calculate the rate of exacerbations over 52 weeks (MD −0.37, 95% CI −0.8 to 0.06; participants=736; studies=4). In the sputum-based meta-analysis (figure 3), significantly fewer adults and children in the sputum-based strategy had asthma exacerbations compared with the control group (73 vs 100; p=0.0002), OR 0.36 (95% CI 0.21 to 0.62); participants=173; studies=4. The NNT for one participant (adults) to avoid any exacerbations was 5 (95% CI 4 to 11) over 16 months. Number of subjects who had ≥1 exacerbation over the study period (SpEos). For the FeNO-based studies, the meta-analysis found no significant group differences in the final ICS dose for adults or children (figure 4). In adults, the direction favoured the FeNO strategy (MD between groups was −147.15 µg budesonide equivalent; 95% CI −380.85 to 86.56; p=0.22; participants=582; studies=4), but the direction in children favoured the control strategy (MD 65.88 µg budesonide equivalent, 95% CI −86.71 to 218.47; p=0.40; participants=317; studies=3) (figure 4). Inhaled corticosteroid dose at final visit (FeNO). All five studies that used sputum eosinophils to adjust treatment reported no differences in doses of ICS used between groups (online supplementary figure 1). The SDs for the groups were not available in Jayaram et al’s paper31 and were estimated based on the data from Green et al’s paper.24 The mean dose of ICS per person per day (µg budesonide equivalent) between groups was non-significant in adult studies (MD 0.67, 95% CI −154.39 to 155.73; p=0.99; participants=262; studies=4). Likewise, there was no difference in daily ICS doses in the sole paediatric study (MD 67.0, 95% CI −264.81 to 398.81; p=0.69; participants=54). Symptom or ACT scores did not significantly differ between groups for FeNO studies in either adults or children (online supplementary figure 2). In adults (four studies), the direction of the difference in scores favoured the FeNO strategy, MD was −0.08 (95% CI −0.18 to 0.01; p=0.09; participants=707), but the direction in children favoured the control group: mean difference was 0.14 (95% CI −0.18 to 0.47; p=0.39; participants=724; studies=2). For the sputum-based studies, the two studies that reported on symptom scores also described no significant difference in symptom scores between groups.23 24 Likewise, for the outcome of asthma QoL scores, there were no significant group differences for the FeNO-based studies in adults and children (online supplementary Figure 3). In adults, there were only two studies and the MD in children was 0.09 (95% CI −0.08 to 0.26; p=0.29; studies=3). There were insufficient data reported from the individual studies to undertake a meta-analyses for the other secondary outcomes (FEV1, AHR, rescue beta-agonist use). While FEV1 was reported in all studies, data points were not provided; the studies described they found no difference between the participants who had treatment adjusted to inflammatory markers in comparison with the control group. As per table 1, 8 of the 16 FeNO-based studies20 21 29 32 34–36 38 used guideline-driven monitoring for the control group. In this subgroup analysis based on trials that used guideline-driven monitoring, the significant difference was no longer present for the primary outcome of number of participants who had one or more exacerbations (OR 0.87, 95% CI 0.47 to 1.61) in adults (four studies) but that in children (four studies) still significantly favoured the FeNO strategy (OR 0.67, 95% CI 0.51 to 0.90). The subgroup analyses results for ‘cut-off FeNO values’ were similar to the main analyses; the FeNO group had significantly fewer exacerbations. As there were insufficient data, we could not undertake subgroup analyses for the other planned subgroups. The risk of bias diagram (figure 5) shows that eight studies18 24–28 31 34 38 were judged as having good methodological quality, but in all studies there was either insufficient details about allocation concealment and/or adequacy of blinding. Seven studies20 23 30 33 36 37 39 were open label or single blinded (six in FeNO studies, one in sputum-driven studies). When data from the six open-label FeNO-driven studies20 30 33 36 37 39 were removed, the primary outcome results (exacerbations) did not change. In adults, the number of participants who had one or more exacerbations over the study period OR 0.63 (95% CI 0.41 to 0.96; participants=432; studies=3) and exacerbation rates (RR 0.61, 95% CI 0.45, 0.82; participants=661, studies=4). In children, the number of participants who had one or more exacerbations over the study period OR 0.67 (95% CI 0.50 to 0.89; participants=887, studies=5). One sputum eosinophil-driven study23 did not use blinding; however, removing the datum from this study did not alter the results of the primary outcome (exacerbations), occurrence of any exacerbation (RR 0.66, 95% CI 0.46, 0.93; participants=218; studies=3) or number of participants who had one or more exacerbations over the study period (OR 0.43, 95% CI 0.24 to 0.79; participants=218; studies=3). For the FeNO-based adult papers, the quality of evidence using the GRADE approach surmises that, of the three outcomes assessed, two were of moderate quality and one (ICS dose at final visit) was very low quality due to wide confidence intervals and the fact that one study39 was open labelled, as well as heterogeneity between doses (table 3). For the FeNO-based children studies, the quality was moderate for two outcomes and very low for one (exacerbation rates). This outcome was downgraded three levels for one open-labelled study,20 imprecision and heterogeneity (I2=67%) (table 4). For sputum-based studies, GRADE assessment shows that the quality of the three outcomes were moderate for two outcomes (exacerbations) and low (ICS dose) due to the lack of blinding in one study,23 and the varied doses within and between studies (table 5). In this meta-analysis, we combined data from our three Cochrane reviews13–15 that evaluated the efficacy of tailoring asthma medications (ICS predominantly) based on airway eosinophilic markers (FeNO or sputum eosinophils) in comparison with controls (clinical symptoms with or without spirometry/peak flow) for asthma-related outcomes in children and adults. Based on 22 studies involving 3500 adults and children (3208 completed), we found that children and adults randomised to either eosinophilic marker strategy (compared with controls) were significantly less likely to experience an exacerbation during the follow-up period (4.5–24 months). The exacerbation rate was also significantly lower in adults randomised to the FeNO or sputum strategy (compared with controls) but not in children. There was not a significant difference in the final dose of ICS in either children or adults. For both FeNO and sputum-based strategies, there was no difference between groups for all secondary outcomes (FEV1, ACT, QoL, airway hyper-responsiveness or beta2 agonist use). In this review updated from our previous combined meta-analyses,12 the data on sputum remained unchanged, that is, using sputum to guide asthma therapies in adults is beneficial for the outcome of reducing exacerbations. The new single paediatric study26 found no significant difference between the groups for this outcome, although it favoured the sputum-based strategy. However, the OR for the combined adult and paediatric studies remained unchanged at 0.36, but the 95% CI was marginally smaller from 0.20 to 0.64 to 0.21 to 0.62. In contrast to the favourable data in the outcome of exacerbations for both sputum and FeNO-based strategies, the data for other asthma outcomes (FEV1, symptom scores, QoL and beta2 agonist use) remained unchanged, that is, neither sputum and FeNO-based strategies were shown to confer any advantage over the control arms. There may be several reasons for this including the known discordance between asthma control and exacerbations.1 While exacerbations are an important outcome, arguably subjective measures of asthma control are also important. Thus, although our findings demonstrate using airway eosinophilic markers to guide medications in future exacerbations, it is debatable whether either strategy should be universally advocated. Sputum analysis is restricted to laboratories with specific expertise, is relatively time consuming and is not always successful, particularly in young children. Use of FeNO universally will add a substantial cost to the millions of people who have asthma. Also, currently there is no evidence-based algorithm on how to adjust treatment based on FeNO levels (or indeed to sputum eosinophil levels) and the various guidelines (such as GINA,1 BTS,2 NAC3) differ on when and how to step up and down asthma therapies. Nevertheless, using airway eosinophilic markers to guide asthma therapy is most likely to be beneficial to the subset of people with frequent asthma exacerbations. This systematic review is limited to 22 studies with 3208 subjects completing the trials. While the studies share some common issues, there are also substantial differences, notably, the definition of asthma exacerbation, the participants, how the decision to prescribe oral steroids was made, the cut-off levels for FeNO and sputum eosinophils were different, the control strategies (that often used uses multiple measures) and how medications were adjusted. Also, 7 of the 16 FeNO-based studies were supported by the FeNO manufacturers, and although we are unaware of any publication bias, we cannot be certain of its existence. Tailoring of asthma therapy based on FeNO or sputum eosinophils has been shown to be effective in decreasing asthma exacerbations in adults. Adjusting treatment based on FeNO levels for children tended to decrease asthma exacerbations at the expense of increased ICS doses. At present, despite their popularity, there is insufficient evidence to advocate their use in routine clinical practice. Further, data starting with meta-analyses based on individual patient data (IPD) of all the studies may further inform the efficacy of strategies based on airway eosinophilic markers. If IPD meta-analysis does not shed more light, e.g., the change in FeNO before medications are adjusted, further RCTs in both adults and children are then required. Ideally, these RCTs should include stratification for example, high versus low doses of ICS, and eosinophilic versus non-eosinophilic asthma and cost-effectiveness. Global Initiative for Asthma. Global Strategy for Asthma Management and Prevention. 2017 http://ginasthma.org/2017-gina-report-global-strategy-for-asthma-management-and-prevention/ (accessed Nov 2017). British Thoracic Society (BTS)/Scottish Intercollegiate Guidelines Network (SIGN). British guideline on the management of asthma—a national clinical guideline. 2016 https://www.brit-thoracic.org.uk/document-library/clinical-information/asthma/btssign-asthma-guideline-2016. National Asthma Council, Australia. Asthma Management Handbook Melbourne. 2016 http://www.asthmahandbook.org.au (accessed July 2017).
. Online NNT calculator [program]. 3 version, 2008. In: Higgins JP , Green S , eds. Analysing and presenting results. Chichester, UK: John Wiley & Sons Ltd, updated, 2005.
. [A study on a therapeutic protocol to improve the control of persistent asthma by monitoring sputum eosinophil counts]. Zhonghua Jie He He Hu Xi Za Zhi 2007;30:334–8. Contributors All authors contributed and reviewed the manuscript. HLP, ABC and KMK extracted the data and performed the analysis. CJC triple checked all data and provided statistical support. Funding Asthma Australia—HLP is supported by Early Career Fellowship; National Health and Medical Research Council—10058213 Practitioner Fellowship for ABC; Programme Grants for Applied Research—13/89/14 Cochrane Programme Grant (KMK and CJC). Competing interests HLP, and ABC have conducted a randomised controlled trial in children on this subject. Other authors have no competing interests to declare.